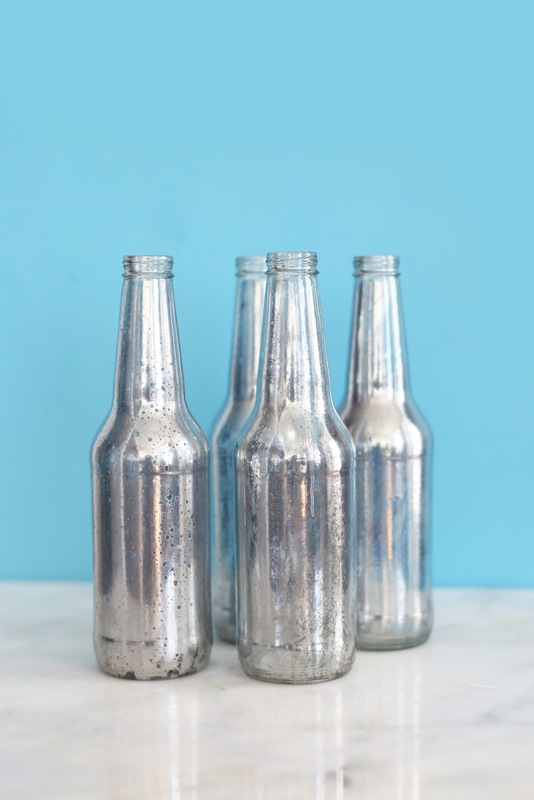 How To Make DIY Mercury Glass / Hey, EEP! 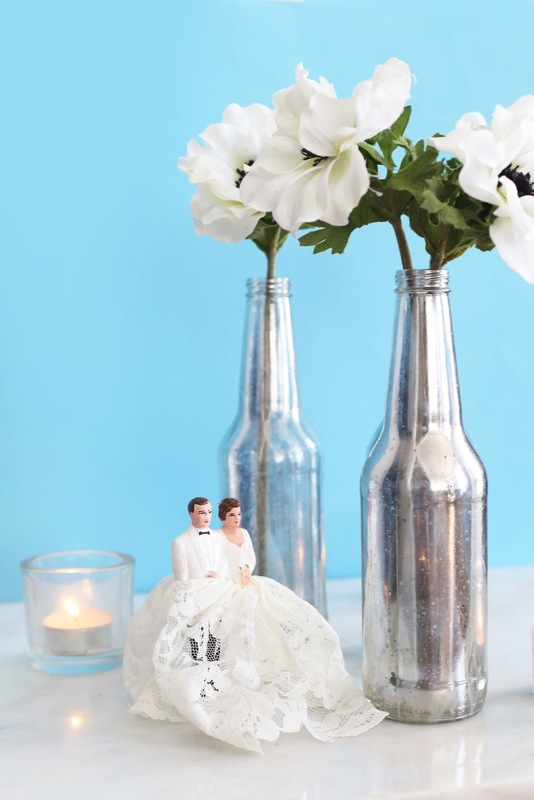 I love all of the mercury glass tablescapes I see on Pinterest but I know it can be tricky—and expensive!—to buy or even rent these gorgeous pieces, especially for a wedding-size celebration. When you're planning a wedding (or, heck, even styling a bookshelf in your home) you're always looking for multiples of the same thing. For our reception last summer, I went crazy collecting over 100 identical brass candle sticks for the dinner tables! So I've been thinking a lot about how to make getting "multiples" easier and greener, turning to a staple in my fridge for inspiration. 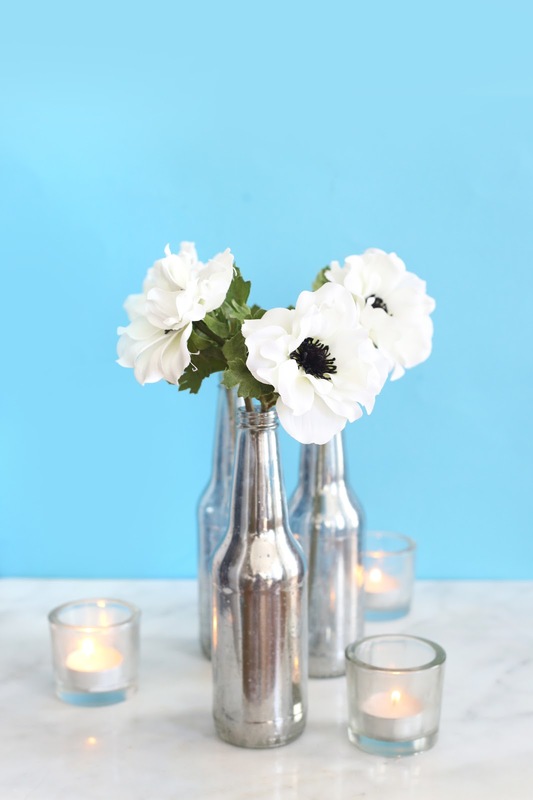 With Earth Day just moments away, I thought it would be helpful if I shared with you this easy trick for up cycling empty glass IZZE bottles into mercury glass vases. It's an easy way to recycle something you probably already have a lot of into something you NEED a lot of! Catch my drift? 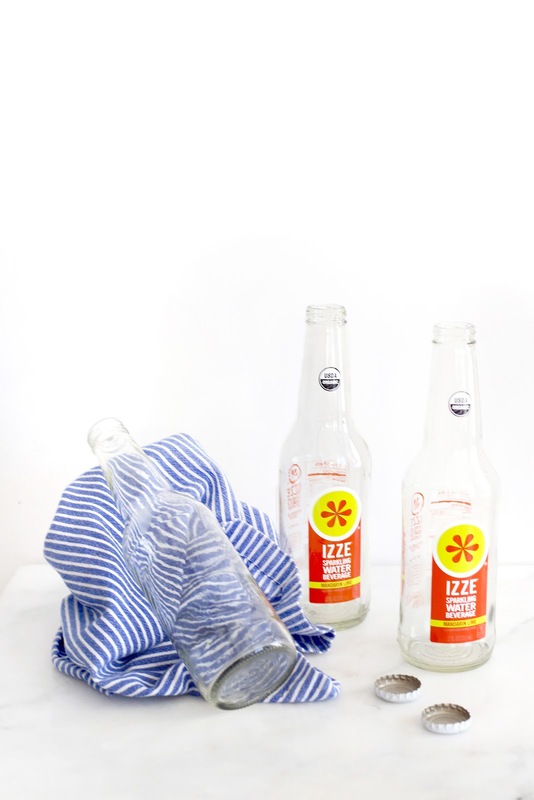 I like to use clear glass bottles, like IZZE bottles, because I think they end up looking the most polished and professional. I'll write out the full instructions at the bottom of this post. 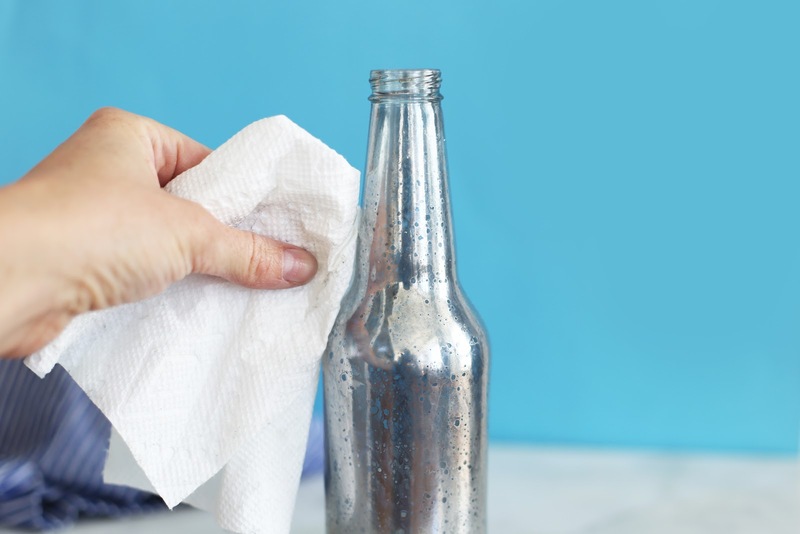 You want to start with clean bottles, so wash them out and make sure they're dry. Also remove the labels, it's okay if a little glue is left over because it'll add to the vintage look. The IZZE labels came right off, actually! 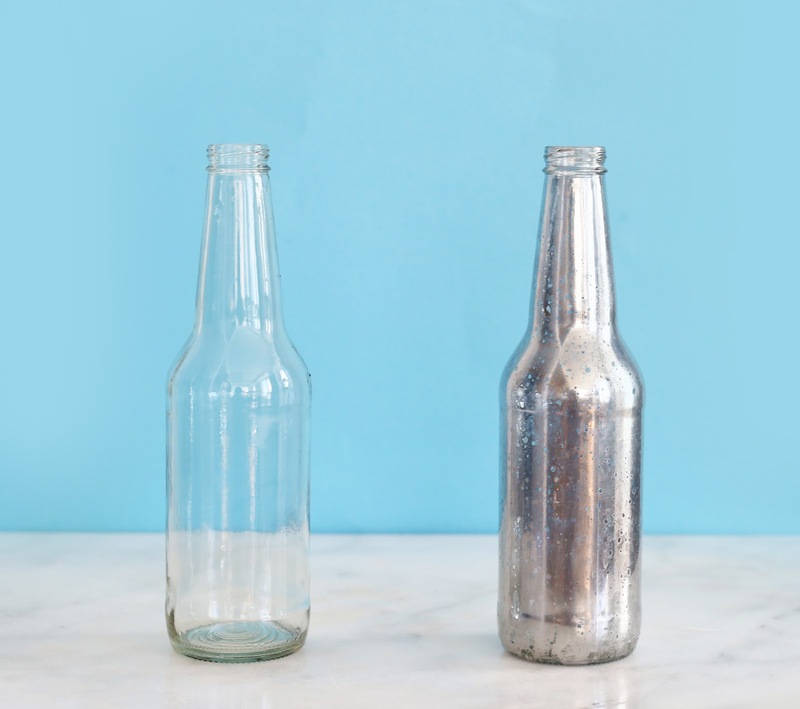 The trick for recreating the mercury glass effect is vinegar. Spritz the bottle with white or apple cider vinegar so there's little beads of moisture all over the sides. Next, spray paint over the vinegar with glass-effect silver spray paint. Yes, I know. 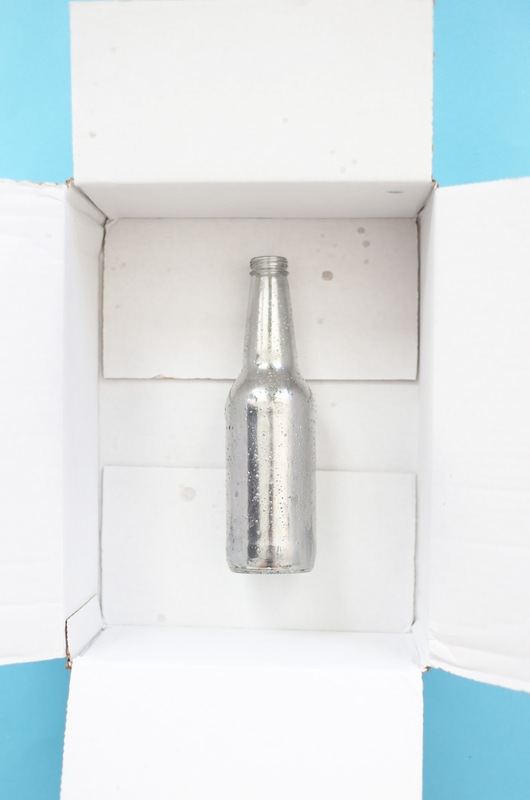 Doesn't spray paint negate the earth-friendly effects of recycling bottles? Probably. But this is what we're doing. The paint won't touch the beads of vinegar, so you're left with a speckled, antique look. You can wipe or blot away the vinegar or let it air dry. You can even gently rub areas with a paper towel to give it a more worn-out effect. 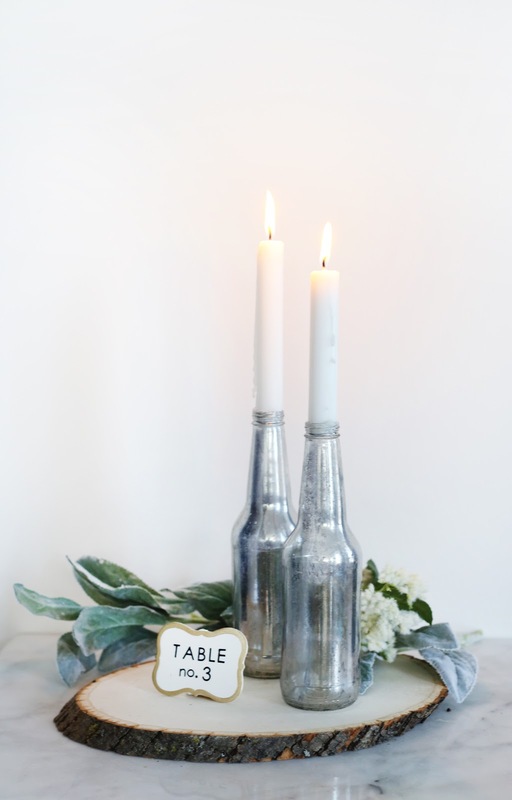 Once your mercury glass bottles are dry, there are countless ways you can use them on your tables. I'm sharing my four favorites, all of which are perfect for a wedding! Honestly, though, you could use any of these around the house, too! Put a single stem or a small grouping of 2 to 3 stems in each bottle. Arrange them a few inches apart down the length of a table or in a circle at the center. This is a great way to stretch your flower budget! 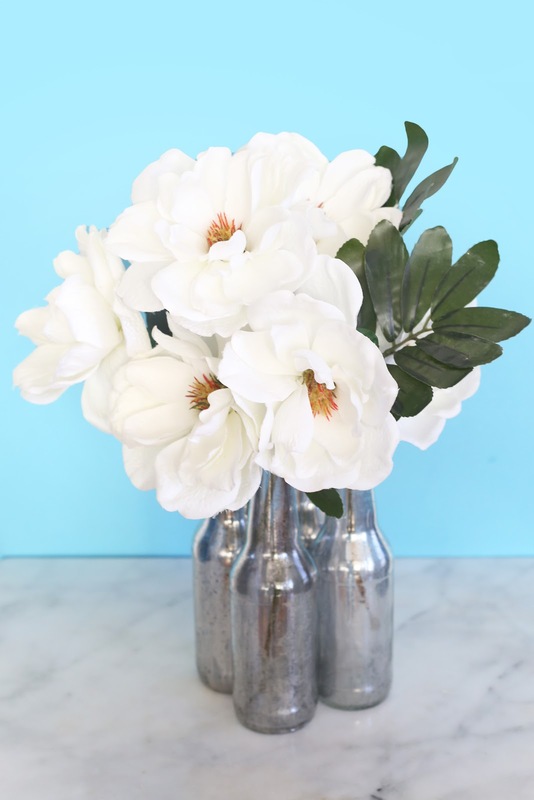 Create the look of a full, overgrown centerpiece by filling each bottle with flowers and greens and then clustering them close together to look like they're in a single vase. It gives you that luxe, mega-flower effect...without the expensive price tag of needing to rent or buy large vases. 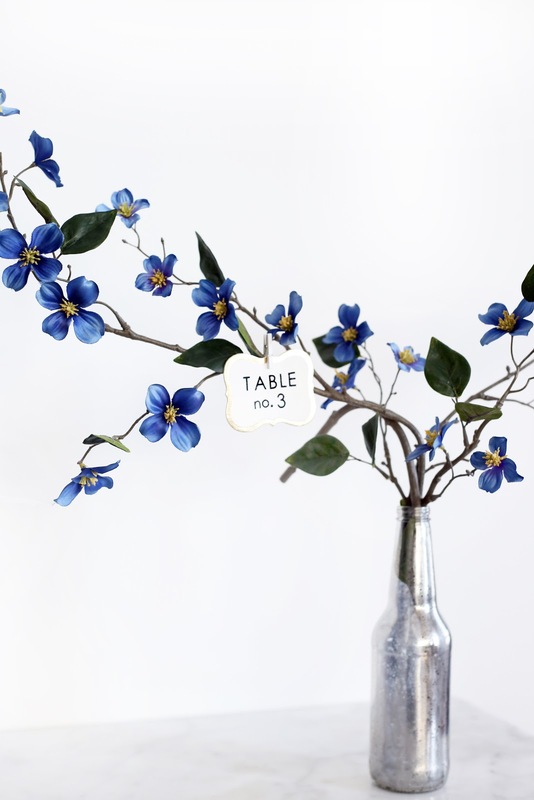 For a romantic, enchanted feeling try placing a single branch in a bottle and setting it at the center of a table. 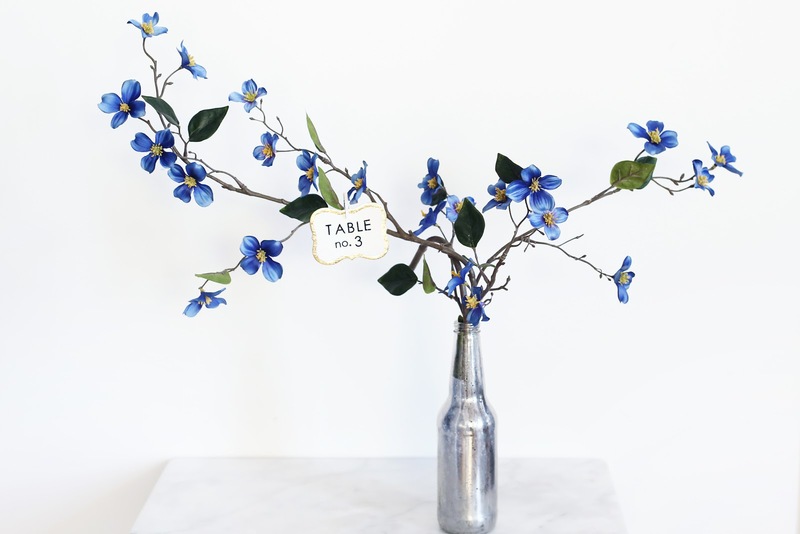 You can attach table numbers using small clothespins or twine. Stick a single tapered candle in each of the bottles for DIY candlesticks. You can shave down the sides of the candle with a knife or vegetable peeler if they're too large for the bottle's neck. If they're too small, try wrapping some masking tape around the base and then insert into the bottle. MAKES: As many as you'd like. 1. 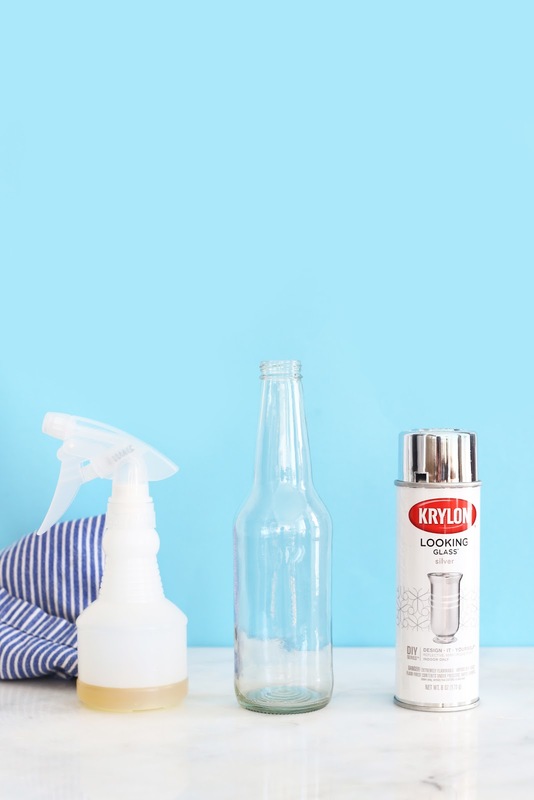 Fill a spray bottle with some vinegar. 2. 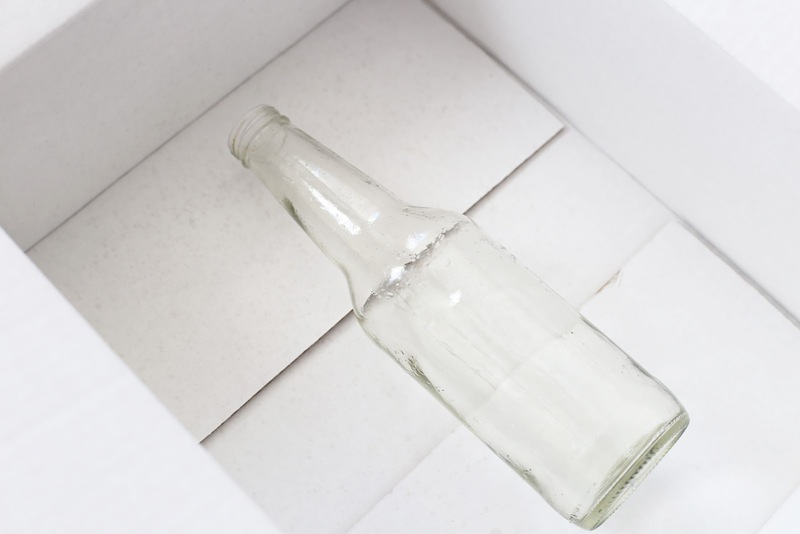 Cover a work surface in a well ventilated area with paper and line up your bottles. Spray each with a little vinegar so the liquid beads on the surface. 3. Spray with the spray paint to coat; let dry and blot or rub away any excess vinegar. Repeat, if desired. Let dry completely.